According to the 2010 census of Southern California, the Laguna Beach population was about 22,723, with 12,923 housing units - 5,791 single detached, 759 single attached, 3,871 apartment units, and 324 mobile homes. The 2010 census placed 16 percent of town under age 18 with a median age of 47 years. The crime rate in Laguna Beach is very low. For much of its modern life, Laguna Beach built modestly. The most popular home was a two bedroom unit, followed by the three bedroom residences. In the 1980s, the market for larger homes heated up and Laguna Beach followed. Many of these homes can be found in the hills. In and about downtown Laguna Beach, many homes have a beach-cottage look. The vast majority of residential housing constructed in Laguna Beach were individually crafted, custom built homes and master planned subdivisions with cooking cutter homes are essentially non-existent. This wide variety of architecture and home styling is part of the cities charm. The city incorporated in 1927 and the city tree is the Eucalyptus. It includes 9 square miles of land and 7 miles of coastline. The city also has wilderness canyons and mountain top trails. Laguna Beach draws 3 million visitors annually. The city boasts of prisitine beaches with crashing waves, sandy coves and tide pools. It has a quaint and pretty downtown consisting of small shops, boutiques, 5 star resorts, bed & breakfasts and numerous restaurants. Laguna Beach has lots of community-civic activities with an emphasis on cultural life. There are foundat ions for schools, opera league, ballet group, chamber music, performing arts support for schools and the Art festivals listed above. The famous artist, Wyland Galleries, calls Laguna Beach home. The Laguna Playhouse is the oldest continually running playhouse on the West Coast. There is local dolphin and whale watching, historical tours, and much more. Laguna Beach was the first city on the West Coast to assign a cop to patrol tidal pools and protect the sea urchins. Laguna Beach started as an artists' colony in the early 20th century and still devoted to the arts today with the annual Saw Dust Art Festival and the Pageant of the Masters. 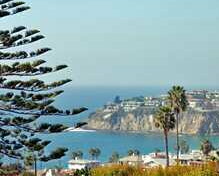 This picturesque city was a favorite of old Hollywood types such as Bette Davis, Judy Garland, Charlie Chaplin and Mickey Rooney who all kept homes in Laguna Beach. Some celebrities reportedly still do but locals take pride in minding their own business. When directors wanted to show the shores of England, Greece, Italy, etc. they turned their cameras on the Laguna coast. It shows up in many movies.